Evergreen Memorial Park has tributes to the pioneers of Evergreen with Old West charm. The Barn Chapel has five historic barns with antique stained glass windows and the park is 100 acres of rolling meadows, a reservoir and even a buffalo herd that you can watch from the reception. A great location for a wedding and amazing photos! In this photo, the couple stood next to the memorial site so I could get a view of the reservoir and the hills behind them. There were speckles of yellow color from a few aspen trees. 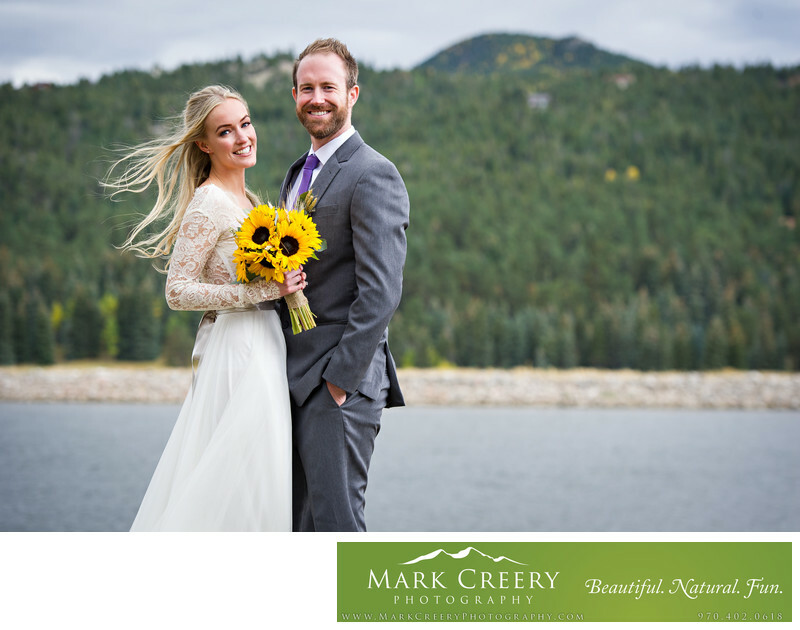 The bride had a simple sunflower bouquet. The Barn at Evergreen Memorial Park is located in Evergreen, Colorado. Contact:(303) 674-9052, TheBarn@evergreenmemorialpark.com.